1. Place melted butter and cous cous in a medium heatproof bowl, add liquid, cover and let sit for 2-5 minutes or until liquid is fully absorbed. Remove cover and use fork to fluff and separate the cous cous grains. 2. Meanwhile, place olive oil, apple cider vinegar, lemon juice and cumin in a small bowl and mix well to combine. 3. 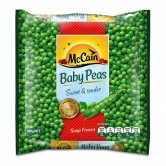 Place McCain Peas, almonds, mint leaves, cranberries, shallots and pomegranate seeds into a large mixing bowl, add cous cous and dressing, toss gently to combine. Refrigerate until ready to serve. 1 Place melted butter and cous cous in a medium heatproof bowl, add liquid, cover and let sit for 2-5 minutes or until liquid is fully absorbed. Remove cover and use fork to fluff and separate the cous cous grains. 2 Meanwhile, place olive oil, apple cider vinegar, lemon juice and cumin in a small bowl and mix well to combine. 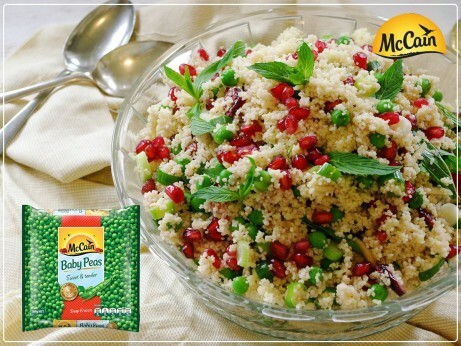 3 Place McCain Peas, almonds, mint leaves, cranberries, shallots and pomegranate seeds into a large mixing bowl, add cous cous and dressing, toss gently to combine. Refrigerate until ready to serve.